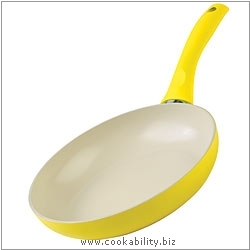 This is an easy-care everyday ceramic frying pan that can be used with induction hobs. Extra thick 5mm construction adds to the quality feel and ensures stability. Triple layer non-stick. Non-stick care advice. These pans can withstand higher temperatures than conventional non-stick without damaging the non-stick properties. We have tested them extensively and have concluded they have a similar workable life as a conventional non-stick equivalent. However, as the non-stick surface is ceramic it will not bubble or flake with age or overheating therefore its non-stick properties can be maintained by seasoning with cooking oil this extends its useful life considerably. Radiant ring, solid plate, ceramic, halogen, gas, induction, dishwasher.